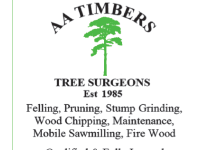 A A Timbers is a professional, family-run tree surgery business with over 30 years of experience. We are based in West Lothian. Our tree surgery services are available to both domestic and commercial customers across a wide area in Edinburgh & The Lothians. We operate an 24 hour call-out service in the case of emergencies, such as fallen trees blocking drives. With extensive experience and expertise in all aspects of tree surgery, our service is ideal for all timber solutions. Whether you need crown thinning, sectional felling or stump grinding, we have the skills and resources to help you today. In addition to our tree surgery, we sell wood chips and fire wood at reasonable prices. Our business is built on a reputation for professional diligence and excellent service. All of our work is fully insured and we are happy to provide references upon request. To see examples of our work. I have just spoken at phone with a gentleman at AA regarding my desire to cut three substantial pieces of oak for a stove surround in the farmhouse. The oak would come from our own woods. Like the reviewers, above, I was hugely impressed with how generous the gentleman was with his time and the detailed knowledge and advice he was prepared to impart. I think it very likely that we will use this company's services. Excellent service, friendly and reliable staff, clean and tidy, would highly recommend. We have used this fast, knowledgeable and very efficient Service to remove large overgrown trees within our property. From felling to grinding stumps and removing the arisings, this Service was 1st class,friendly and reliable. I would use this Service again.